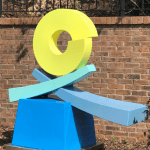 Roswell Arts Fund premieres the third annual ArtAround Roswell Sculpture Tour, featuring ten original works of art on display throughout the Roswell community. These temporary sculptures will join six permanent ArtAround Roswell pieces purchased from previous tours in 2016 and 2017. The ArtAround Roswell Opening Celebration will be held on Saturday, April 14, 2018 at Riverside Park, 11:30 am to 2:30 pm. 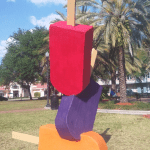 The free event will be located near Ice Pops, a giant colorful popsicle sculpture by artist Craig Gray, sponsored by Synvous. This family-friendly celebration will feature entertainment, including a live band and dance performances, a ribbon cutting, interactive games, food trucks, arts and crafts activities, King of Pops popsicles, and more. “Mini-tours” of ArtAround will be offered, and shuttle service, courtesy of Carl Black, Roswell will be provided on a free but limited basis.  An ArtAround Roswell audio tour, with commentary from the artists about their inspirations, materials and processes, is available from Otocast. Download Otocast from the Apple or Google Play store to enjoy an artist-guided tour at your convenience. Celestial Fish by Donald Gialanella at Roswell Area Park Lake, sponsored by Canton Place Development. Granite Ring by Chris Rothermel at Roswell Cultural Arts Center, sponsored by Miller Lowry Development. The Uniting of Work and Spirit by Robert Clements at Mill Park, sponsored by Randall-Paulson Architects. 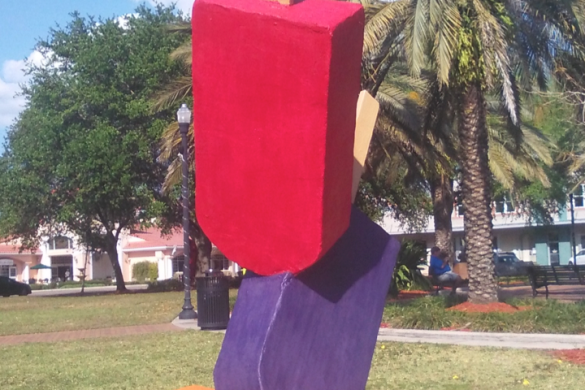 Votive by Gregory Johnson at Don White near Volleyball, sponsored by Lennar Multifamily Communities. 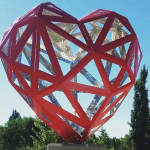 Open Low-Poly Heart by Matthew Duffy at East Roswell Park Entrance, sponsored by Gas South. Dual Nature by Cecilia Lueza at Big Creek Park Entrance of Old Alabama Rd, sponsored by Aesthetic Speciality Centre Plastic Surgery & Dermatology. Horse Apple by James Hetherington at Leita Thompson, Arts Center West Entrance, sponsored by Pieper O’Brien Herr. Social Tones by Nathan Pierce at Hembree Park, sponsored by ALDI, Inc. 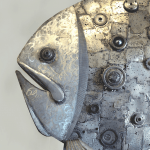 Ask the Fish 2.0 by Dr. Stephen Fairfield at Don White Park at 400 Bridge, sponsored by Carl Black Roswell Buick, GMC. Four new locations have been added to this year’s tour: Roswell Mill Park, Roswell Cultural Arts Center, Hembree Park, and Leita Thompson Park near the Arts Center West Entrance. The tour has also been extended by 3-months to run from April 14, 2018 to March 2019. 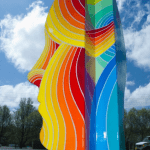 After receiving more than 70 sculpture entries, the ArtAround Roswell Public Art Selection Panel, narrowed the selection to ten unique pieces. This panel is comprised of diverse Roswell stakeholders including business, civic and community leaders as well as art professionals. Pieces were selected based on a number of criteria, including quality, diversity and how the sculpture would spark conversation and activate spaces. 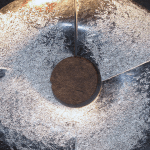 Other factors included size, safety and aesthetics. Join us at our Opening Celebration on April 14, 11:30 for food, fun, music and games.